Pasay City North High School – Main which is presently located at Virginia St., M. Dela Cruz, Pasay City was initially named Basa Air Base College – Annex situated at Villamor Air Base, Pasay City. The operation at Villamor Air Base started in 1972. Originally, the Pasay City North High School was named Basa High School. It started as a barrio high school in 1966 at Basa Air Base, Floridablanca, Pampanga. During the first year of operation, only three year levels were opened— first year to third year. The initial enrollment was 625. In 1967, the school offered the complete four years of secondary level. It catered to the military dependents of the Philippine Air Force enlisted personnel. Wives of the military officers who are qualified were invited to teach. In April 23, 1969, Honorable Onofre D. Corpuz, the then Secretary of Education approved the conversion of Basa Air Base High School into Basa Air Base Community College. The school started to accept students from the neighboring communities. In January 26, 1977, under the Proclamation of P.D. 1078 entitled “ Decree converting the Basa Air Base Community College into Philippine Air Force College of Aeronautics providing a charter or purpose of defining the school as one of the State Colleges. This charter however, did not provide for government subsidy as it was considered a non-profit, non-stocks educational institution. In June 1988, Republic Act. no. 6655, an act transferring the administration, supervision and operation of the Philippine Air Force College of Aeronautics-High School Department to the Division of City Schools, Pasay City was implemented. Moreover, DECS Order No. 22, s. 1989; transferring to DECS the management of secondary schools of the State Colleges and Universities SUCS and DECS Order No. 06, s. 1990 clarified and amended DECS Order No. 22, s. 1989 on Secondary Schools of the State Colleges and Universities SUCS. In June 3, 1992, Republic Act No. 7605 – an act converting the Philippine Air Force College of Aeronautics into a State College or be known as the Philippine State College of Aeronautics and for other purposes, amending Decree No. 1078, entitled Converting the Basa Air Base Community College of Aeronautics providing for a charter for this purpose was implemented. In October 1992, Pasay City Council Resolution No. 463, s. 1992, a Resolution renaming the Philippine Air Force College of Aeronautics – High School Department to be known as Pasay City National High School was approved. This was sponsored by all members of the City Council. In 1993, the High School Department was detached from the Philippine State College of Aeronautics. The high school moved to Tramo St., Pasay City bearing the name Pasay City National High School. In August 28, 1995, The Pasay City Council approved Resolution No. 765, s. 1995. This is a Resolution amending Resolution No. 463, s. 1992, Renaming the Pasay City National High School to be officially known in all nomenclatures, designation and transactions as Pasay City North High School for all its interests and purposes. And from this day where this Resolution was approved and effective, Pasay City North High School which was located at Tramo St., Pasay City became the Main and the annexes of the said school adopted and used the same title of the school such as, the Pasay City North High School – Cuneta Annex which originated in Sangley, Cavite City; The Pasay City North High School –Basa Annex, the origin of the schools; and the Pasay City North High School – Mactan Annex located at Mactan Air Base, Lapu-Lapu City. In June 2010, the Pasay City North School-Main which is located at Tramo St., Pasay City moved to where it is now, Virginia St., M. dela Cruz, Pasay City. A newly constructed building with 17 classrooms housed the 1,338 students from first year to fourth year. There were also 7 function rooms for the Principal’s Office, Guidance Office, Accounting, Library, Records and Supply, and for the Department Heads. The school which originated from Basa Air Base, Floridablanca, Pampanga was founded by the late Officer, Col. Norberto P. Furagganan, Judge Advocate General Office, Philippine Air Force. Pasay City North High School was formerly the High School Department of the Philippine Air Force College of Aeronautics located within the vicinity of the Villamor Air Base in the City of Pasay. This semi-private institution continued what it has been started as academic provider to the original place in BASA Air Base in Pampanga and extended its role in Mactan Air Base in Cebu City. During those times, large percentage of its clients was composed of military dependents residing inside the Villamor Air Base. In 1989, when Philippine Air Force College of Aeronautics was transformed into a state college, the high school department was then absorbed by the DepEd. 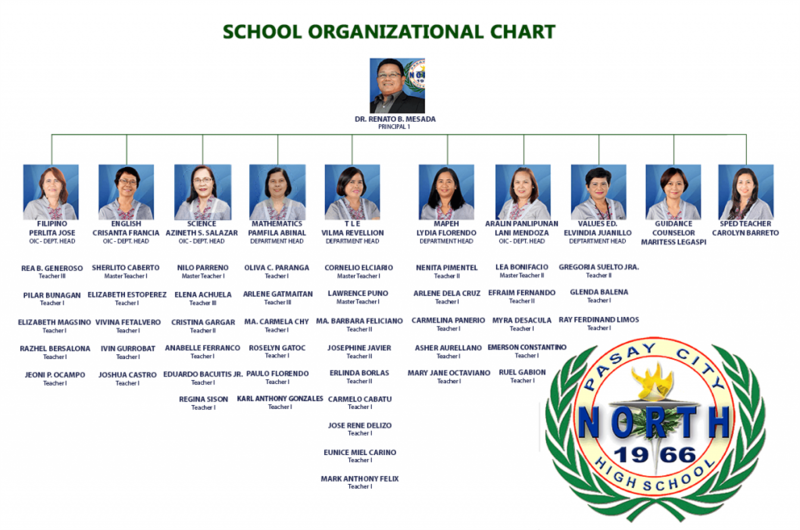 This institution was named as the Pasay City North High School, having another annex inside the compound of Cuneta Elementary School, emerged as the 4th public secondary school in Pasay. This new public school was situated along Tramo Street in Barangay 57 Zone 8, Pasay City. From Tramo where the school started to operate as the main campus, it was then transferred last 2010 at Virginia Street, M. Dela Cruz, of the same City. At present, the school is lead by the school head, working with the teaching and non-teaching personnel. Three department heads and five Officers-in-charge of different departments, of which one of whom is a Master Teacher II, help in the supervision and management functions of the school head. Likewise, teaching staff from which 52 are permanent and no one is on contractual status give their utmost sacrifices in undertaking the anticipated obligation as academic and non-academic facilitators. Other members of the human resources include 22 non-teaching staff with 18 permanent while four in contractual status. This comprises also the four security guards from Ex-Bataan Agency and four utility workers from the Front Runners. 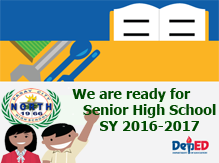 Pasay City North High School is a school equipped with modern facilities and highly spirited teachers who can directly inspire students to be academically competent, technologically shaped and value oriented individuals. With his vision, the school is committed to produce a highly creative, innovative, dedicated and competitive graduates under the supervision of compassionately trained teachers, supportive parents and community. 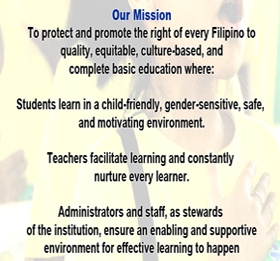 Through our mission, this school exhibits wonderful characters that will definitely meet the requirements of the 21st century. To sustain the essentials of the k – 12 program which are needed in crafting a globally competitive student, the school is equipped with state – of –the – art establishments- Audio Visual Room, Gymnasium and different Technology and Livelihood Education rooms such as the Computer Laboratory, Mechanical Drafting , Dressmaking and Tailoring and Electrical installation rooms which will surely enhance the aptitude of the students in their preferred courses. Moreover, the endowment of the local government are pragmatically used in providing ultramodern paraphernalia which will furnish our facilities. With that, learners will be technologically shaped to compete in our today’s dynamic world. The school also exalts its jubilant and well – trained teachers provided with high quality education from country’s famous state universities. With their enhancing and witful words, lessons are well discussed to the students accompanied with enjoyable teaching materials. Their compassionate hands will surely transcend boundaries in age gap creating camaraderie between the students and the school faculty. With the past revolution of our world and changes in both local and international community, we the Filipino people must also strive for us to be globally competitive and be able to contend against the challenges of our world. 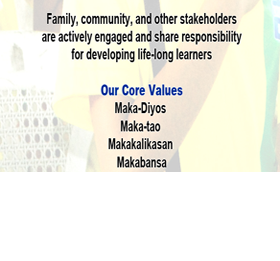 Thus, our decision must start in having a good education came a developed and competitive academe. Pasay City North, I say is an explicit example. So what are you waiting for, come and enroll to a school equipped with modern facilities and excellent teachers.